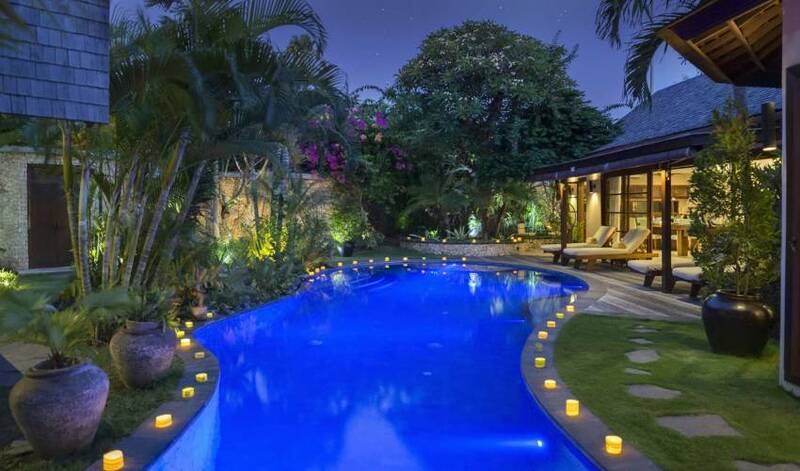 Quietly secluded in over an acre of private landscaped gardens, and surrounded by majestic Liana trees, after which the villas are named, the estate promises an unforgettable tropical vacation. 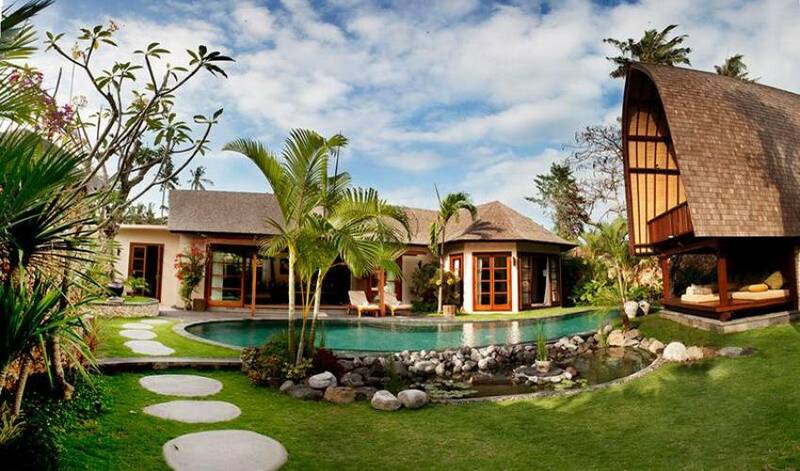 Although the peacefulness of their serene garden setting makes it hard to believe, the villa estate is conveniently located in the heart of cosmopolitan Seminyak, only a short stroll from the beach and some of Bali’s most fashionable restaurants, bars and boutiques. 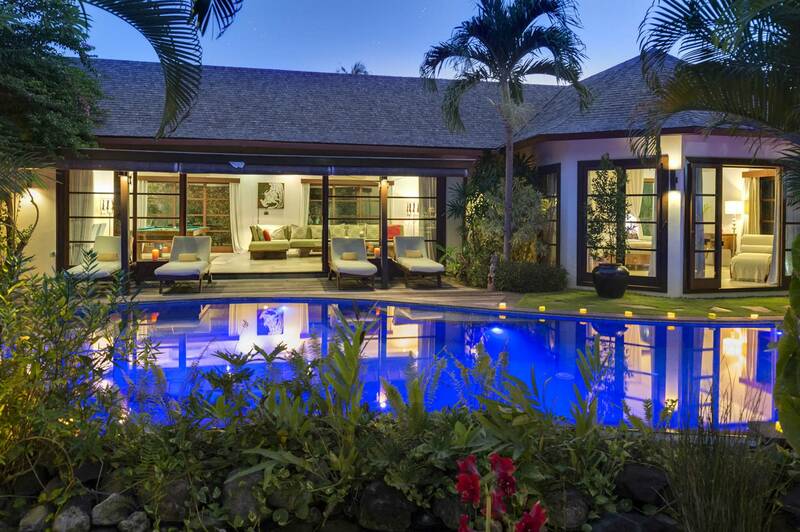 The five-bedroom Villa I and two-bedroom Villa II that make up this exclusive enclave feature spectacular swimming pools, first-class facilities and timeless charm. A full-time team of 22 staff (including three accomplished chefs) ensures guests are pampered throughout their stay. Providing even more luxurious space, a one-bedroom suite can be rented in conjunction with either (or both) of the villas, to give a total of eight bedrooms, making the estate suitable for everyone from couples to families or larger groups, weddings and events. 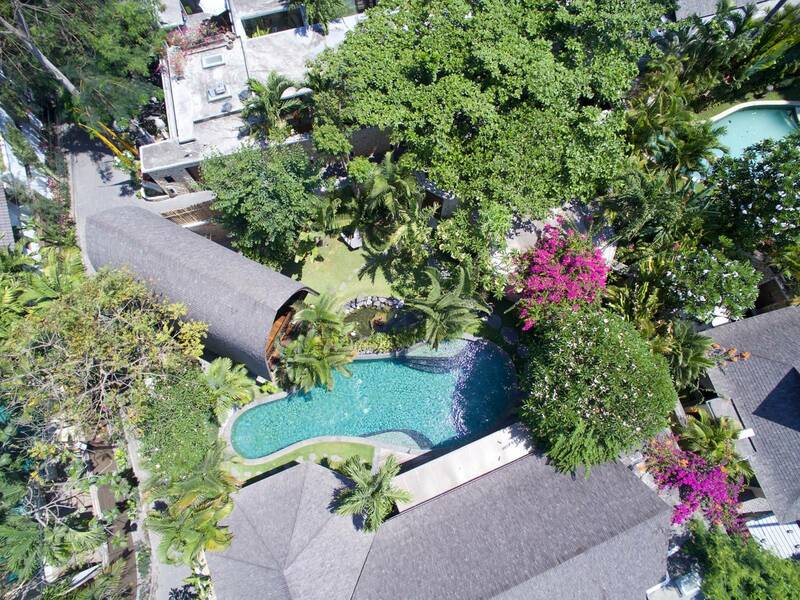 It can be a tall order finding a chic beach villa that’s within a heartbeat of Seminyak’s popular restaurants, bars and boutiques and at the same time is blissfully free from traffic hustle and street bustle, yet that’s the promise of the estate. LataLiana means ‘Place of tall trees’; it’s the perfect name for a 4000sqm garden sanctuary bound by some of the most beautiful trees in the area. A 30-year-old baobab ‘upside down tree’ provides dappled shade while spectacular flame trees release showers of scarlet petals. Free-form swimming pools snake across lawns of Japanese grass dotted with gnarled frangipanis, and schools of koi ripple orange hues across fountain-sprinkled ponds. In the midst of nature’s bounty are private self-contained villas – the five-bedroom Villa I and two-bedroom Villa II – each a cluster of individual pavilions offering generous living space, glamorous bedrooms, shaded terraces, secret courtyards and quiet corners. From polished teakwood and terrazzo floors below vaulted sirap (ironwood shingle) roofs, to twisted handles fashioned from namesake ‘liana’ vines gracing wooden doors, nature has influenced the design of these chic, contemporary villas. With an abundance of hi-tech toys such as Blu-ray players, surround-sound, iPads and WiFi, there’s plenty to keep guests of all ages amused beyond the swimming pool. Both villas boast a pool table and share a table-tennis table and a stable of bikes – there’s even a baby grand piano in Villa I. 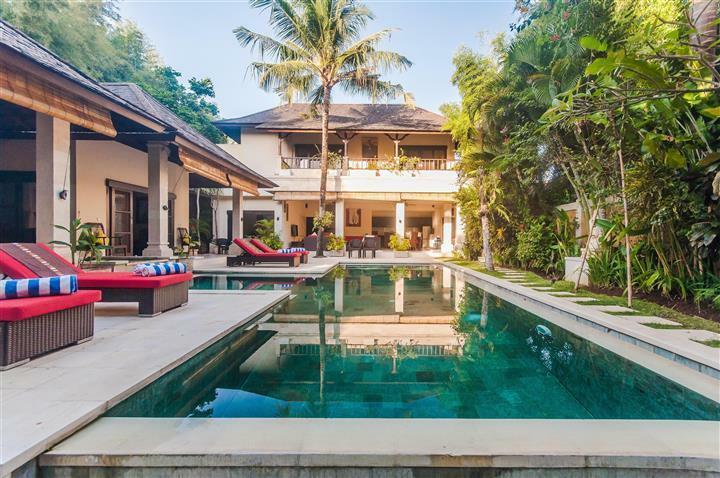 Guests benefit from a sensational location: 300 metres beyond the villa walls is the wide expanse of Seminyak Beach with its famed surf breaks and sunsets. 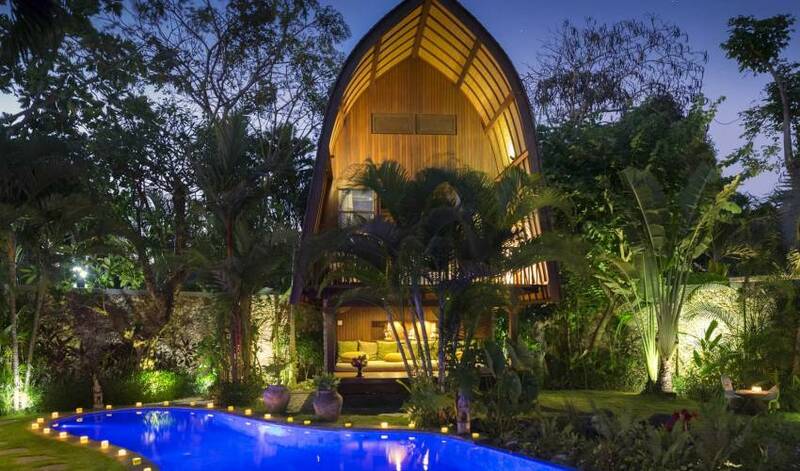 A shuttle is on hand to whisk guests to Spa Venus at Villa Kubu (the estate’s sister boutique villa hotel and spa) or to Seminyak’s many delights. Gado Gado, one of Bali’s top-rated restaurants, is moments away, as are a myriad other culinary landmarks. That said, with three resident chefs among the 22-strong staff on stand-by to whip up gourmet meals from a well-priced menu of local and international dishes, there’s really no call to leave the villa grounds at all. In addition to Villa I and II, the enclave includes the self-contained one-bedroom Suite. This can be rented in conjunction with one (or both) of the villas, giving a total of eight bedrooms and making the estate suitable for everyone from couples to families to groups of friends. 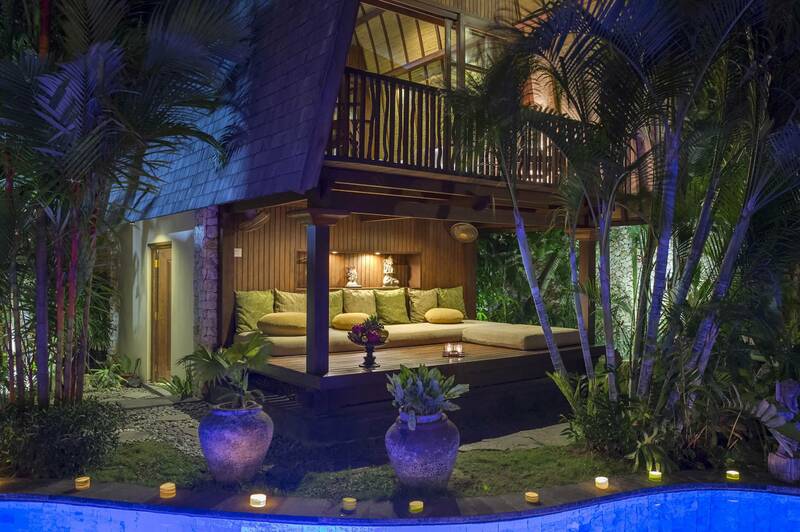 Set within a walled garden, the villa comprises two buildings framing a free-form pool. Within the single-storey ‘longhouse’ stretching the full length of the garden is an open-plan living, dining and kitchen area and a master bedroom suite. 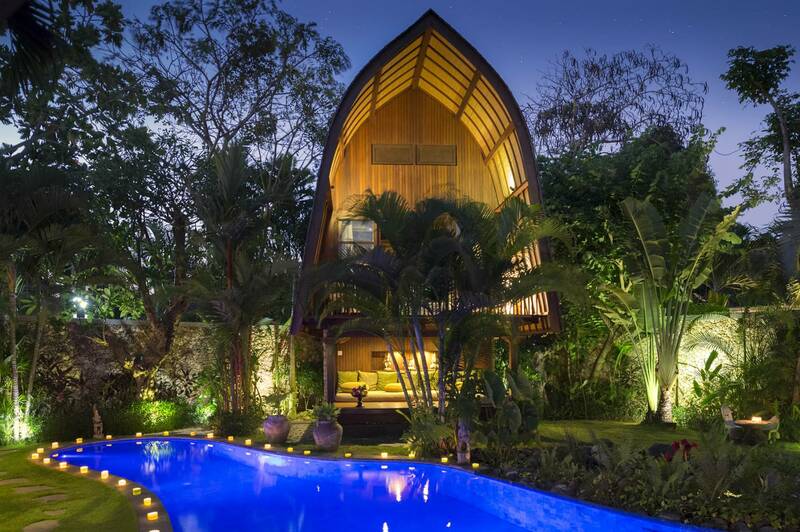 To one side of the pool is a two-storey building inspired by a traditional lumbung(rice barn) with a distinctive bonnet roof. 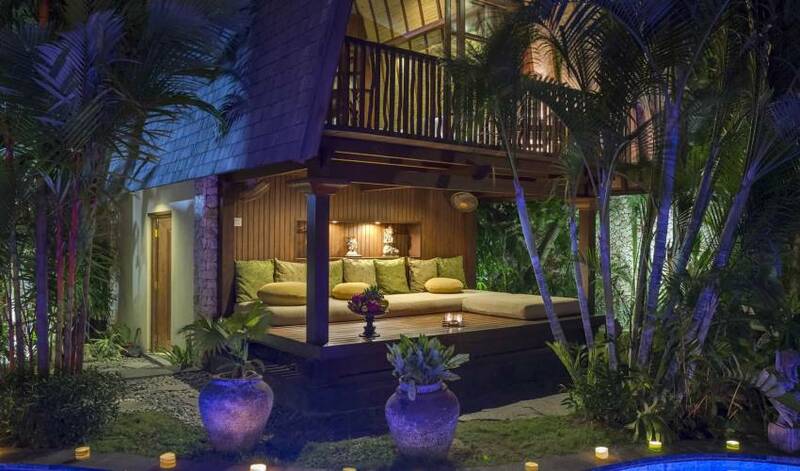 This houses a two-tiered bedroom on the upper level, and a kitchenette and bathroom below, with a comfortably furnished covered deck for poolside relaxation. 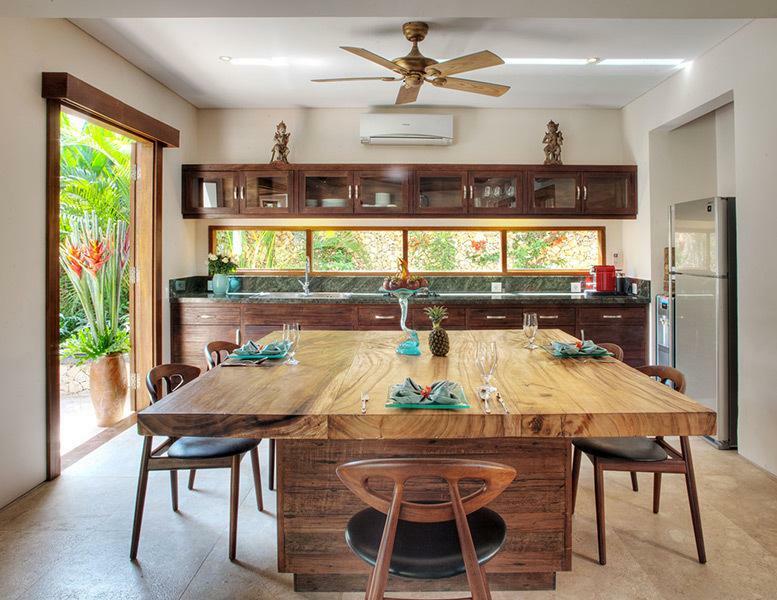 Generously sized for a two-bedroom villa, the large open-plan living room has several distinct areas for relaxing, dining and playing in fan-cooled or air-conditioned comfort. At one end, under a pitched roof, huge deeply cushioned sofas arranged around a coffee table create a convivial space for socialising or watching a film on the large-screen satellite channel TV with Blu-ray disc player. Beyond a full-size pool table is the dining area with a square table for eight and well-equipped galley kitchen. 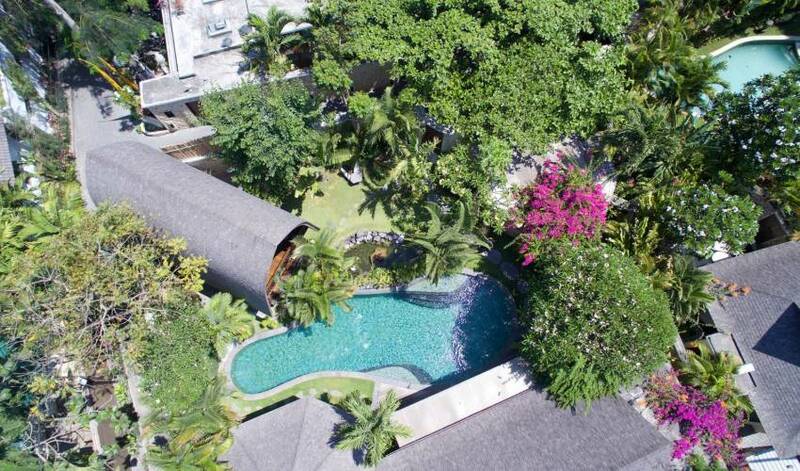 Sliding glass doors open onto the partially covered deck where sun loungers line the 17-metre free-form pool and, set within a pretty patio, is a circular table and two chairs guarded by an ancient frangipani tree. A sweep of French windows that fold open to the swimming pool shape the contours of the glamorous master bedroom. 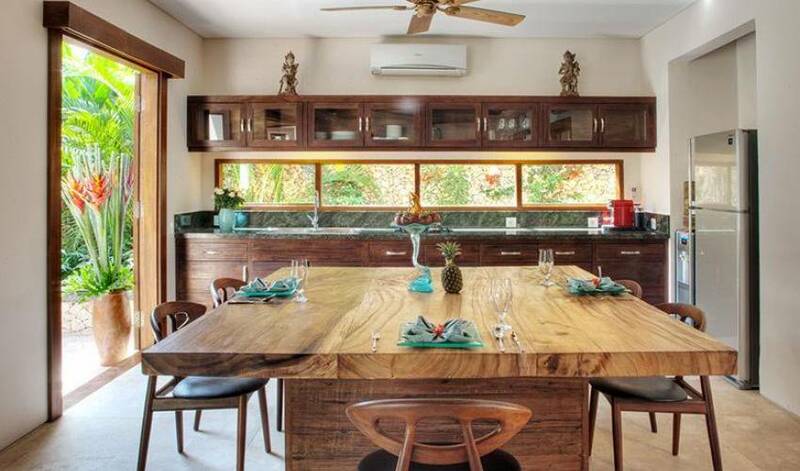 Here, the curved recycled wood panels of the bed and cabinets betray their origins as part of a phinisi schooner. The king-size bed is cocooned in a curtain of mosquito netting that cascades from runners set into the ceiling – an innovative system that enables them to be drawn back for a sense of space during the day. There’s a choice of air conditioning or ceiling fan, and other creature comforts include satellite-channel TV, Blu-ray disc player and iPod dock. The non-slip floors of acid-washed marble flow into the large ensuite bathroom, which has a dressing area, twin washbasins, freestanding bathtub for two, and a walk-in rain shower open on one side to the fresh air. The lumbung bedroom has been designed with youngsters in mind – but is equally suitable for a romantic couple or even a family happy to share their space. With a king-size bed (that converts to twins) and a double bed reminiscent of a ship’s berth set into an alcove, this fully air-conditioned bedroom can comfortably accommodate four people. Ladder steps lead to a small mezzanine furnished with two sofas (one of which provides two single mattresses). The bedroom’s polished timber floor extends through sliding glass doors onto a balcony framed by the bonnet-shaped roof and overlooking the villa’s pool. The bedroom is equipped with a satellite-channel TV, Blu-ray disc player and iPod dock. Downstairs, glass doors from the bathroom’s dressing and vanity area lead to a pebble-floored courtyard with an open-air rain shower. 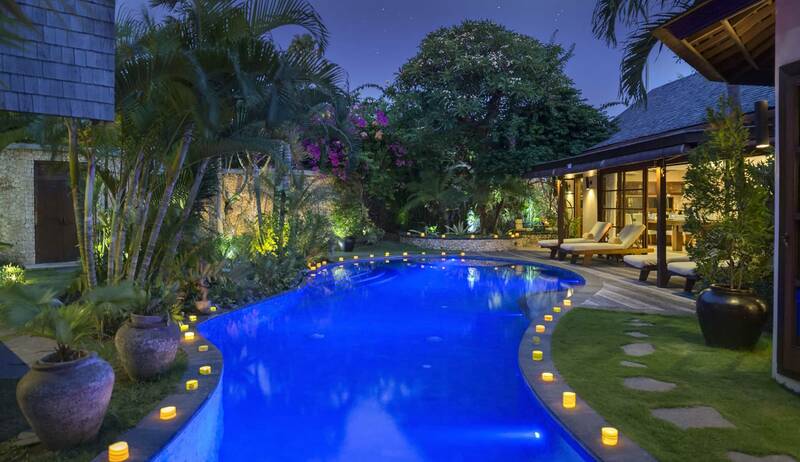 The LataLiana enclave lies down a quiet cul-de-sac in the heart of Seminyak. Only 249m away is Seminyak Beach with its world-class surf breaks, panoramic coastline views, popular beach bars and legendary sunsets. A stroll away is an astonishing choice of cocktail bars, designer boutiques, internationally acclaimed fine-dining restaurants and hot night spots. The neighbouring Mesari Stables offers horse rides along the beach.